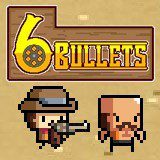 Face other enemies in a deserted land and try to kill them all by using six bullets. Enjoy shooting your enemies and collecting bullets after kills. Don't run out of ammunition and make sure that you dodge their shots!